​​ HOUSTON – Construction has begun on a six-story speculative Class A office building at 19350 SH 249 in the Champion Forest area. 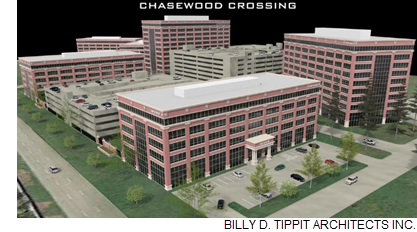 ​​​The 156,000-sf building, called Chasewood Crossing Three​, is expected to be ready for interior buildout in ten months and ready for tenants in 14 months. The structure will be one of six office buildings slated for the $320 million, 32-acre Chasewood Crossing business park projected to finish in 2022. Leasing prices are roughly $21 NNN. When complete, the entire 110-acre Chasewood Crossing development is expected to include several acres of pad sites for restaurants, 29 acres of medical tenants, 15 acres of senior living options, and a 20-story, mixed-use condominium project.